Another one of my favorite venues in NYC for dramatic wedding photographs is inside the timeless structure known as Grand Central Station. Most wedding photographers shy away from a place like this thinking that it is simply too crowded and too busy for serious photography. Tunnel vision on their part. Sure, the main concourse may have thousands of commuters walking about at any given time of the day, but there are quiet little corners, like the one pictured here, that can be taken advantage of by a creative photographer, equipped with the necessary gear and working with a wonderful, enthusiastic couple such as this one. Sometimes you just have to think outside the box. We’ve all seen pictures of the Grand Concourse at Grand Central Station with it’s huge lobby surrounded by the awe-inspiring column lined walls. But unless you want a couple of thousand strangers milling around in your wedding photographs you may have to look elsewhere within the confines of this grand old building. 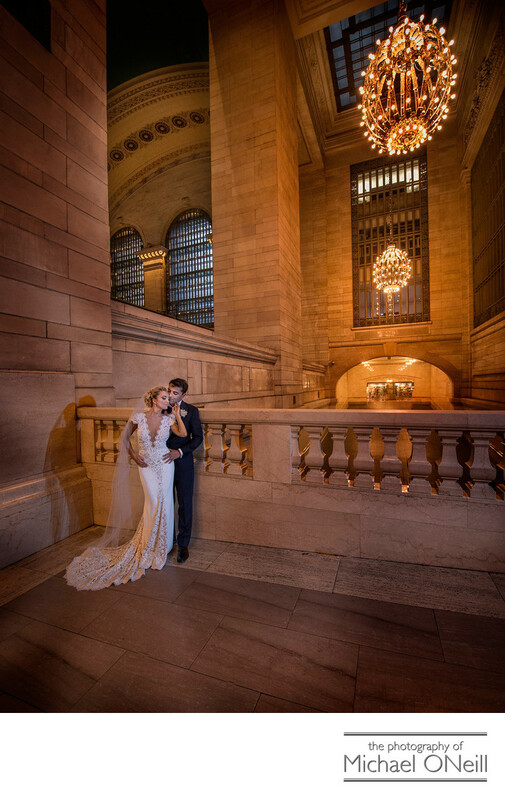 If you’re planning a NYC wedding and wish to take advantage of some of NYC’s iconic landmarks and buildings for your wedding photographs make sure you work with the right photographer. One that has not only the right equipment but, also, the right frame of mind...and the ability to look beyond the obvious and think outside the box. Only then will you be rewarded with the finest wedding pictures imaginable.